This week will not only mark the month of November but it will also note the second half of the season. We have seen much action already in this season and we saw plenty of it this past week. From a bizarre finish in London, in the morning nonetheless, to some exciting finishes in Cincinnati and Glendale, to a stunner on Monday night in Landover. With all of that in mind, here are my Week 9 picks. The Saints returned home and got a big and impressive victory over the Packers. But can they go out and do something they haven't done all season long: win on the road? Carolina fought hard in a low-scoring loss to the Seahawks, but they didn't look all that good and Seattle isn't all that hot of a road team. I think Drew Brees can find some success in the air against an underwhelming pass defense of the Panthers. Cleveland bounced back from the awful loss to Jacksonville to win against Oakland. That would have been a nice accomplishment if Oakland wasn't absolutely awful. But their very soft stretch of their schedule continues as they host a Tampa Bay club that could've beaten the Vikings at home, but they fell in overtime. The Browns are not as good as their record, but Tampa Bay is so the former will win. It really hit the fan for the Jets on Sunday against Buffalo. I could go on, or you could listen to Mike Francesa here and here. Michael Vick is now the guy going forward after the ultimate Geno Smith meltdown, but he has go to into Jackson County and take on a Chiefs squad that have won four out of five. Give me the Chiefs at home, I'm not certain that the Jets can beat anybody right now. No means no but even bizarre PR moments aside, one cannot discount Washington and Colt McCoy for going into Arlington and pulling off a nice upset of the Cowboys on Monday. Robert Griffin III doesn't look quite ready to come back and we all know Kirk Cousins isn't good so it looks like McCoy may be the guy in short term. The team still isn't that good but then again, neither is Minnesota. I like Washington to keep it going. UPDATE: Griffin will be playing this Sunday, and I think that Washington will still win. The Bengals were able to coax a big win out of their ball-game with the Ravens on Sunday at home to move into first place, while Blake Bortles took virtually no care of the football in Jacksonville's loss to Miami. I wouldn't necessarily rule out a letdown for the Bengals but even then, I would be very much stunned if they dropped this game. These teams are coming off different results, but I don't think there is any question which is the more impressive team. Philadelphia has only lost twice and both to good teams in terms of San Francisco a month ago and Arizona on Sunday. The Texans did get off their three-game schneid but only against a Titans squad that has been pretty darn mediocre this year. The Eagles will get their first road win in a month and change this Sunday. San Diego fell apart defensively against Peyton Manning and it prevented them from making it a serious game this past Thursday. Now they'll have to face a Miami club playing very well, particularly on the defensive side of the ball. But even then, I like Philip Rivers to get the Chargers back on track, even in an early game. Dallas fell in disappointing fashion to Washington on Monday night amid controversy regarding Tony Romo's potential injuries and his reinsertion back into the game. At this moment his status isn't certain yet but it looks like he should be good to go this Sunday, and the Cowboys may need him because the Cardinals have been stout against the run (and awful against the pass). I'm not sold if Romo will be totally healthy so I do like the Cardinals on the road. Austin Davis fell a little back to Earth this past Sunday as he largely struggled as the Rams got smoked by the Chiefs at Arrowhead. I'm not sure if they will get beaten down quite like that again but it isn't going to be easy for them this Sunday in Santa Clara. Give me the Niners. Seattle looked underwhelming once again but even then, they got the win. I think there is certainly a good amount of concern surrounding the defending Super Bowl champs because they really haven't looked like a Super Bowl contender by any stretch these past few weeks. But even then, Oakland is terrible and Seattle still is pretty good at home. They are my Lock of the Week. Who doesn't love the Peyton Manning-Tom Brady showdowns? The last time these two matched up was in the AFC Championship Game when the Patriots were utterly embarrassed in Denver? Will they get their revenge? It will certainly be a heck of a game but I think the Pats will do just enough to pull this one out in Foxborough. Just when it looked like the Ravens were moving forward and the Steelers were taking a back seat, the Ravens fell in a tight road contest in Cincy while Big Roethlisberger tore up the Colts through the air en route to a massive stats day and a big win. The last time these clubs played, the Ravens more or less embarrassed the Steelers at home way back in September. 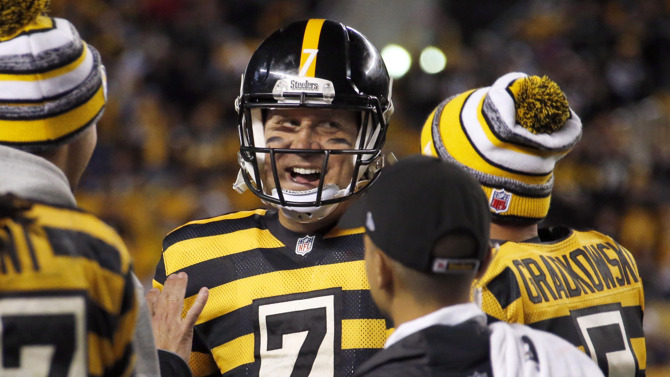 Pittsburgh will not embarrass the Ravens, per se, but they will get the big win. Ben Roethlisberger was able to torch this Indianapolis defense with ease en route to a whopping 522 yards and six touchdowns through the air, so Eli Manning may be able to find some room to through the ball here at home. However, I think that will not be enough. Andrew Luck will torch this mediocre Giant defense and get the Colts back to their winning ways.